“Pakistan had been a haven for war-affected Afghans for decades, but now Pakistan itself is facing the same problems of terrorism and militancy that Afghanistan has been suffering for the last three decades. We are going back to Afghanistan because Pakistan no longer offers jobs, security and peace of mind,” says Jahan Sher while returning to his home town Mazar-e-Sharif. The economy of Afghanistan has improved during the last four years, he boasts. UN High Commissioner for Refugees (UNHCR) claims that more Afghan refugees have returned to their homeland from Pakistan this year than in the previous year. Increasing incidents of harassment and arrests by Pakistan’s law enforcement agencies following terrorist activities in the country, poor socio-economic conditions, floods in Khyber-Pakhtunkhwa and increase in forcible deportation are key factors compelling the refugees to go back, refugees’ leaders and rights activists believe. Pakistan has been host to the world’s largest refugee population. Millions of Afghans fled to Pakistan in the 1980s after the Soviet invasion and during the rule of Taliban in the late 1990s. Currently there are some 1.6 million registered Afghans in Pakistan, with 45 per cent residing in refugees camps and the rest scattered amongst the host communities. Last year, Pakistan and the UNHCR signed an agreement to extend the stay of Afghan refugees until the end of 2010. About 3.7 million refugees have returned to Afghanistan in the past 9 years, according to UNCHR. “A total of 1,09,383 Afghans have gone back in March-October through the UNCHR’s return programme, while the number of refugees returning to Afghanistan in 2009 was 51,290,” said Duniya Aslam Khan, UNHCR Pakistan’s Assistant Public Officer. “The number of returnees this year has increased by 51 per cent when compared to the number of people that returned in 2009. Refugees registered in the country are receiving a better assistance, transport and reintegration package, including a grant of $100,” added Khan. “Most of the returnees cited the difficult situation in Pakistan, worst economic factors and improvement in some provinces of Afghanistan as the important reasons for their decision to return,” said Nader Farhad, a UNHCR spokesperson in Kabul. “After the continuing terrorist attacks on offices of Pakistan’s security agencies, the crackdown against Afghan refugees, both registered and unregistered, has been accelerated across the country. 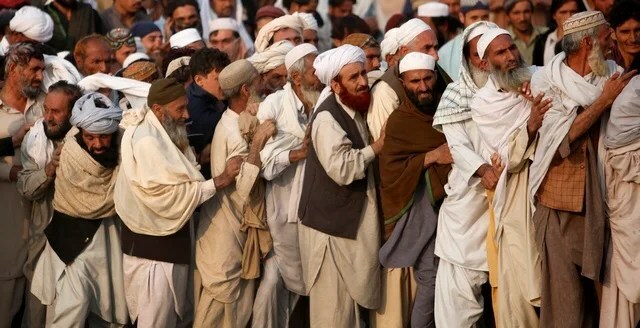 Thousands of refugees have been arrested and forcibly deported,” said Haji Sohrab, the representative of Afghan refugees appointed by Afghan Consulate in Karachi. “Many Afghan refugees who do not have Proof of Registration (PoR), a document given to these refugees jointly by the government of Pakistan and UNCHR, face strict action by the police,” informed Sohrab. “Thousands of Afghans, especially students in religious seminaries, daily wage workers and scavengers, have been arrested under the Foreign Registration Act (FRA) during the last two years and deported to their homeland,” said Iqbal Shah Khattak, a law teacher at Urdu University, Karachi. However, refugees complain that police and law enforcement authorities have time and again raided houses in the refugee camps and other areas and arrested even those community members who had PoR. “Refugees lived without any legal document for 28 years, till the 2007 registration when they were provided the PoR cards. This gave rise to a lot of legal problems. They could be stopped, searched and arrested under the FRA,” said Khattak, who has worked extensively on refugee rights in Karachi. Afghans in Pakistan have been regularly complaining about harassment and detention at the hands of police, he added. Amid crackdown against illegal Afghan immigrants across the country, industries are now forced by the government not to hire foreign workers without documentary proof, thus adding to the employment problems of refugees. Denying the reports of arresting refugees with PoR cards, police claim they are arresting only those Afghan immigrants who are living illegally and without documentary proof. “We arrest illegal Afghan immigrants under FRA as well as the refugees involved in crimes,” said police officials, requesting anonymity. Media reports suggest hundreds of Afghan refugees have been detained by police across the country as a pre-emptive security sweep ahead of Muharram. Majority of refugees are returning to Afghanistan because of worst flooding in Pakistan. Twenty out of 29 refugee camps across the province were swept away by flooding, destroying thousands of homes and leaving about 85,500 refugees homeless. One of the worst hit refugee villages is Azakhel in Nowshera where 23,000 people lost homes. Instead of going back to their villages, most of the returning refugees are settling in cities where they could find jobs easily. “Due to the prevailing insurgency in Pakistan’s tribal areas and Khyber-Pakhtunkhwa, thousands of Pakistani Pashtuns are coming to Afghanistan for jobs,” said Basir Ahmed Hotak, an Afghan journalist. UNHCR’s officials and refugee leaders confide to TNS that a large number of repatriated refugees are coming back to Pakistan after taking money from UNHCR. “Going back to Afghanistan was a mistake as the security and economic situation is not good in Afghanistan,” said Hafeez Shah, who recently returned to Karachi from Afghanistan. Some of the returning refugees complain that there is no shelter, electricity, schools, hospitals and employment opportunities in Afghanistan which compelled them to come back to Pakistan. Human Rights Commission of Pakistan (HRCP), in its report tilted ‘Afghan Refugees in Pakistan: Push Comes to Shove’ expressed concerns over closure of refugees camps and intimidation of refugees at the hand of police. But Najamuddin Khan, Federal Minister for SAFRON (Ministry of State and Frontier Region) said their repatriation was completely on voluntary basis and the government wants their respectful return. The ministry had suggested to UNHCR to give $5000 to each Afghan family returning to Afghanistan for shelter and livelihood there. KARACHI – The outlawed Tehreek-e-Taliban Pakistan (TTP)’s network in Karachi is completely shattered, senior police sources claim. Police have arrested dozens of Taliban militants fleeing from Khyber Pakhtunkhwa and tribal areas after the 2009 military operations in those regions, the sources said. Karachi, the country’s commercial hub and a city of 18m, is considered an ideal place for militants to lose themselves in the crowd. So far this year, police have arrested 75, compared to 79 all of last year, according to a survey of media reports. The suspected TTP members came mostly from Swat, South Waziristan and Orakzai, and some possessed ready-to-use suicide jackets and huge quantities of explosives and weapons, police said. On September 22, two Afghan Taliban suspects, Abdullah Al-Hajri and Qari Hamza Ali Shah, were arrested on Super Highway, police sources said. They were planning to kill Faisal Raza Abidi and Farooq Sattar, two Karachi parliamentarians who belong to the Pakistan People’s Party and Mutahida Qaumi Movement, sources added. Another high-profile catch is Fawad Ali, a reputed aide of Swat TTP leader Maulana Fazlullah. Police seized the suspected bomb-maker August 30 in Qasba Colony. He was arrested with 1kg of explosives, Criminal Investigation Department (CID) senior official Omar Shahid told Central Asia Online. On August 30 police arrested Ashgar and Riaz, said Irfan Bahadur, a senior police officer overseeing Sohrab Goth and adjacent areas. The pair allegedly ran the South Waziristani TTP branch’s financial affairs, Bahadur said. “Police have largely broken TTP’s network in the city because we have arrested consecutive amirs (heads) appointed for Karachi, including Akhter Zaman Mehsud and his successors, Bahadur Khan Mohmand – alias Sadiq – and Maulvi Saeed Anwar,” one anonymous official claimed. Police accuse the detainees of beheading innocent civilians, attacking security forces and police, destroying private property and committing other crimes in Khyber Pakhtunkhwa and the tribal areas. Still another arrest on June 3 netted four heavily armed suspected dacoits (bandits) in Ali Garh Colony after an attempted bank robbery. Police later identified the suspects as TTP members. The arrest of the Afghan Taliban’s suspected second-in-command, Mullah Abdul Ghani Baradar, in January spotlighted the city’s role as a Taliban sanctuary. “I personally know that a dozen hard-line militants who killed innocent Swatis and burnt their houses have been arrested in Karachi by local police,” Jamal Nasir Khan, a former Swat district mayor, told Central Asia Online. They raise funds through extortion, bank robberies and kidnappings and send the money to training camps in tribal areas where militants plan terrorist acts, Khitab said. TTP-affiliated clerics in tribal areas have issued fatwas authorising their followers to commit crimes to fund the fighting, according to media reports. Many suspected militants admit during interrogation that they came to Karachi to raise money for activities in tribal areas, police said. The suspects reportedly have admitted to hijacking oil tanker trucks and committing robberies and kidnappings. They send half of their ill-gotten gains to commanders in tribal areas, police added. Taliban insurgents from the Federally Administered Tribal Areas (FATA) and Khyber Pakhtunkhwa prefer not to stage militant acts in Karachi, preferring instead to raise money there, a senior police official and counterterrorism specialist told Central Asia Online on condition of anonymity. Militants are fleeing tribal areas to escape the threat of aerial attacks, a political activist hailing from South Waziristan but living in Karachi said. “We are getting information that the TTP is forming links with other jihadist networks or splinter groups in the city and recruiting people from here to fight in Pakistan’s tribal areas and Afghanistan,” a police official said, adding that authorities are cracking down on TTP-linked jihadist groups. A recent wave of sectarian targeted killings in the city left dozens dead. Evidence leads to links with TTP Waziristan, said Pakistani Interior Minister Rehman Malik. Militant groups trying to re-establish contact with each other have been foiled and have suffered numerous arrests, he added. The crackdown on militants has taken a toll on police, as dozens of them have died, one official said.